Boeing and Shanghai Airlines celebrated the delivery of the carrier's first 787-9 Dreamliner today, the airline says it plans to use the aircraft on its regional and long-range service from its base in China's largest city. The new aeroplane, with a special symbol of "100" on its fuselage, is the 100th aeroplane for Shanghai Airlines, a subsidiary of China Eastern Airlines. "We are so excited to take delivery of the very first Dreamliner for Shanghai Airlines, as well as China Eastern Group," said Li Yangmin, vice president of China Eastern Group. "With the introduction of these new aeroplanes, China Eastern Group will also officially launch the global leading new generation Passenger Service System. We are confident that all these efforts will help us significantly upgrade our services and we know our passengers will love it." "We are thrilled to expand our long-standing partnership with Shanghai Airlines and the China Eastern Group. 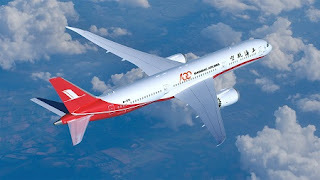 The 787 Dreamliner's unmatched performance, operating economics and comfort make it the perfect aeroplane for Shanghai Airlines to expand and enhance their international network," said Ihssane Mounir, senior vice president of Commercial Sales & Marketing for The Boeing Company.